The history of a parish is closely linked with all the families having lived in that town. To gain information on the beginnings of Ste. Elizabeth, we had to thumb through old publications of La Liberté and Les Cloches de St. Boniface and reminisce with the elderly; especially Mrs. Clarinda Désaulniers now 95 years of age and residing with the Oblate Sisters in Ste. Anne. A paper prepared by René and Doris Dupuis in 1970 on their hometown was for us a source of information. The parish of Ste. Elizabeth, situated between two municipalities, Montcalm and De Salaberry, was twelve sections long by eight sections wide. It was in 1898 that this town had its beginnings, when Father Adélard Fournier, celebrated mass in the home of Mr. Mrs. Adolphe Lacharité. This family deserves our acknowledgement for their hospitality and devotion towards the missionaries and pioneers of this region. In 1901, Ste. Elizabeth was officially established as a parish by its founder, Father David Fillion, parish priest of St. Jean-Baptiste. A rectory with an upstairs chapel was built and Bishop Adélard Langevin name Father Elie Rocan, at Montreal, was also the first ordained priest from St. Boniface College. 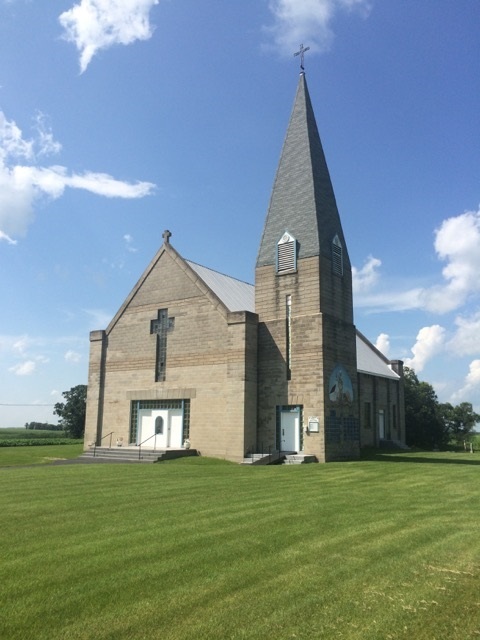 The pastor of St. Pierre showed great interest in this newborn parish by making many contributions. He donated the statue of Ste. Elizabeth, two paintings, etc. Father Fillion donated the vigil lamp and Father Martin of St. Joseph, the first altar. In the St-Boniface Archives, we read about a meeting held in August 1901 to discuss the construction of a 66x20 feet building that could be used as a granary or a barn. The total cost could not exceed $600.00. Each parishioner were to pay by November the sum of five dollars. This building became the parish hall. The bishop made his first pastoral visit in 1902. It was then that twenty-nine parishioners received the sacrament of Confirmation. The parish now had a debt of thirteen hundred dollars. The church steel bell costing $ 125 and weighing 1400 lbs. was blessed at this occasion. Mass was celebrated by the Trappist Fathers of St. Norbert. Father Sauvé played the organ and Mr. Audet spoke on behalf of the parishioners. It was during the summer of 1903 that the project of building a new church (60x40 feet) was started. The new church cost more than $3500. The interior and the steeple are still not completed in 1905. The parish at this time is made up of 47 families; 324 residents. The following year we celebrated the blessing of a 600 lb. bronze bell that came from the studio of Mans, France. The names given to the bell were: Adélard, Elizabeth, Marie, Joseph, Elie and Maxim. We note the presence of nine priests at this celebration besides Mr. Maxim Rocan father of our parish priest, and other dignitaries. In December 1909 we celebrated the tenth anniversary of the parish by installing an altar costing $175.00. This altar has been built at St. Hyacinthe, Quebec. To keep in mind their benefactors, three statues were place in the church. They were given by Odilon and Josephat Désaulniers, Octavien and Gaspard Bérard and the parishioners. The bishop was greeted with solemnity. People would go out to meet him and accompany him at his return. A former resident recalled the arrival of the bishop with Father Desrosiers. As they neared the town one would ring the church bell. Unfortunately, the rope broke and the bell ringer had to climb to the steeple to keep the bell tolling! The weekly paper La Liberté reported that in 1913 the church steeple was completed by the talented Pierre Gagné of St-Pierre-Jolys. Father Elie Rocan shared his life with the settlers. He boasted of 4 cows, 4 horses, a quarter section and provincial highway 23 and provincial road 200. He himself worked at clearing this land. Someone reported that one day somebody meeting Father Rocan on his way back from the field asked "How’s everything, Father?” "Oh”, he answered, "I’m sure after the devil it has to be the mosquitoes”. In 1915, Father Rocan was replaced by a genuine administrator, Father Eugene Chamberland. Under his supervision the parishioners worked at embellishing the church surroundings. In 1916, church steps were built by Mr. Théodule Miron and in 1917 everyone gave a hand at building sidewalks. In 1918, two professionals were hired to paint the church. A collection was held to provide funds for the purchase of an organ. In 1918, Father Mastai Mireault took charge of our parish. He was noted for his mechanical talent. An inheritance provided him with the necessary funds to attend the Eucharistic Congress in Rome. He also bought a Chrysler which everyone admired. We enjoyed the hospitality of his housekeeper, Pamélia Leblanc, who had a warm welcome for everyone. In 1930, we had a very humble and soft-spoken priest in the person of Father Evariste Halde. Many remembered the many books he had and so willingly lent to his people. His devoted maid Miss Marie Laferrière fulfilled her duties. In 1938, Father Armand Hébert worked in our midst. In October 1939, the local Credit Union was formed with Father Hébert elected as a committee member. Father Pierre Picton, born in France, was to be our next parish priest in 1941. Even though he suffered from ill health, Father Picton stayed with us until 1945. He spent his last years on historical research for Manitoba and French families. In 1946, Father Aimé Décosse was called upon to be our parish priest. He was a serious man called to fulfill a very special role. In 1948, he was named Bishop of Gravelbourg. Father Morin, now looking after the parish of St. Joseph, was asked to replace Father Décosse. The first day of May 1951, both the church and the rectory were destroyed by fire. A new church with adjoining living quarters for the priest was then built of concrete blocks with a wooden steeple. The contractor was Mr. Homidas Roy. With neighboring districts helping out financially and with parishioners putting in free labor, the edifice was dedicated the following year, with Rev. Morin celebrating mass. In 1952, Rev. Jolicoeur already known as a French school inspector, was sent to our parish. He had the training of the altar boys at heart and he rewarded them often for a job well done. Rev. Jolicoeur died in 1980. Funeral services were held in his hometown of LaBroquerie. From 1956-1957, we had Father Edouard Fontaine. A young priest by the name of Rev. Paul Deschênes had a short stay from 1957-1958. Then Rev. Philippe Brunet came in July 1958. In October of the same year he lost his life in a car accident. He met his fate at a CPR level crossing near Whitemouth, Manitoba while returning from his former parish. Two other passengers also lost their lives in this tragic accident. It was then that Rev. Robert Nadeau looked after the parish of Ste-Elizabeth and Aubigny until 1965. It was in 1963 that the Catholic Women’s League was organized under the leadership of Mr. Noël Alarie as president and Mrs. Arthur Desaulniers as secretary. Father Nadeau had no trouble in holding the attention of the congregation as he conveyed the message of the Lord. He did it with simplicity and humour. Succeeding Father Nadeau was Rev. Jean Louis Caron who in turn was replaced by Rev. Paul E. Boisjoli. Since 1974, Rev. Lionel Thibault, residing in Aubigny, looked after Ste. Elizabeth. The French Canadian families remaining today will forever be grateful to him for enjoying, to this day, the privilege of having mass celebrated every Sunday. Even though Ste-Elizabeth never was a big town, it used to boast of most necessities. Across from the church was the bank of Hochelaga. In 1939, a Credit Union was initiated and owned its own premises. The first president was Mr. Léo Péloquin and his wife Yvonne and first secretary. In the years that followed Roland Lussier, Albert Bérard, Rosaire Dupuis and Lionel Lussier acted as secretaries. In 1953, the Credit union had its office transferred to St. Malo. In 1901, Mr. Henri Fontaine ran his general store which was later purchased by Mr. Odilon Désaulniers and his brother Josephat. In 1923, these later built a new general store which they operated until 1937 and also suffered the services of a local transfer business. Veteran drivers were Mr. Léo Gélinas and Mr. Adrien Desaulniers. The following were managers of the store during a period of time -- Léo Peloquin, M. Labossiere, Roméo Marion on partnership with Armand Ayotte, Aurèle Désaulniers and finally Arthur Désaulniers. Mr. Henri Fontaine’s home served many purposes. At one time it housed the post office, a store, a boarding place and even a barber shop where young and old met to play pool and cards. Let’s mention a few barbers who kept the town people well groomed; Arthur Fontaine, Zacharie Lemire and Maurice Marion. A blacksmith shop was built in the early 1900’s which was a very important building in those days, welding, shoeing horses and repairing farm machinery. Here are the names of those who served; Jean-Baptiste Désautels, M. Martel, Philippe Miron, Aimé Bellerive, Gustave Gluck, M. Charbonneau, Mathias Bérard, M. Zeltra. In 1946, Georges Desaulniers built and opened the first garage but, it too went the way of the others due to the proximity of larger centers. A Quebec commune group, who has turned it into a workshop where furniture is either made or remodeled, today occupies this garage. The town even had a hat-maker at one time and that too went the way of the hats. The garage still owned by Wilfrid Dupuis and his son Aurèle was purchased from Léo Aquin. The first store later became a cheese factory which was in operation for six years; the second floor served as a community hall while the main floor became a delivery stable to accommodate the farmers when they came to town. Efforts were made to enhance the progress of the little community. Attempts were made to obtain the passing of the railway through town but to no avail. The government had dug two wells but the water proving to be of adverse quality, both had to be plugged so as not to contaminate the water of the Marsh River. The first car to roll in Ste. Elizabeth was the homemade rig of Mr. Aimé Bellerive in 1915. That same year Mr. Odilon Désaulniers owned a Dodge. Eddy Collette and Pierre Samson had the first steam engine. Mr. Bellerive was the first farmer to purchase a threshing machine in 1911. Amédée Collette purchased the first tractor in 1920. Alcidas Collette owned the first combine in 1930. At the start of the century, the first settlers of Ste. Elizabeth of French Canadian origin were: Ephrem Marion, Adolphe Lacharité, Philippe Collette, Octave Collette, M. Longtin, Charles St-Godard, Gaspard Bérard, Octavien Bérard, Albert Marion; in 1901 – Maurice Dupré, Théodule Miron, J. B. Rivard, Joseph Dumont; in 1902 – Dosithée Dupuis, Alfred Gariépy, Désautels Bros., Henri Fontaine, Alfred Lacharité, Alfred Gilmore, and Amédée Marion. Later came Stephen Lécuyer, M. Fansett, Ed Lussier, Zotique Clément and Léopold Barnabé. In 1911, new names appeared in the records of the parish. They were Emile Franconnier, Noé Landry, Wilfred Gilmore, Alfred Bertrand, Alex Champagne, Zacharie Lemire, Adonias Touchette, J. A. Dame, Joseph Leblanc, Arthur Demers, Ed Collette, Thomas Bernèche, Alire Collette, Oscar and Ildège Marion, Pierre Trudel, Onésime Bellemare, Odilon and Josephat Desaulniers. Henri Fontaine, Pierre Samson and Ozias Gratton. Those settlers bought their land from Emmert Land Agency who had acquired it from wealthy American entrepreneurs. It is said that a certain Mr. E. C. Rohmer, a well-off Illinois banker and Mr. R. Sheppart a millionaire Industrialist, at one time owned vast tracts of prairie land between Ste. Elizabeth and Dufrost, and apparently operated a hog and cattle ranch business, employing up to fifty people. These forerunners of Ste. Elizabeth had built the first roads and drainage canals in the area. This land was later sub divided and sold to the French settlers. In 1924, between 30 and 40 families from Russia settled on land close to Ste. Elizabeth in search of peace and freedom of religion. In spite of hardships and difficulties encountered they were pleased to be settled on land that was providing them with their daily bread. About 1945, a Hutterite group, namely the Oak Bluff Colony purchased a considerable tract of land west of Ste. Elizabeth, and established residence where Philippe Collette and Arthur Demers used to live. The necessity of building schools went hand in hand with a new parish. The majority of the French Canadian students attended St. Martin and Levis schools while the Village, Molloy, Empress and Jerome Schools catered mostly to English speaking students. The teachers who taught in those schools deserve an honorable mention for having worked under difficult conditions. We would like to especially thank those teachers who have labored to maintain the French language along with the English language even though the Public Schools Act in 1916 abolished the teaching of French in public schools. Ste. Elizabeth School: Rev. Fournier, Palmyr Beauchemin, Ozanne L. Heureux, Antoinette Carrière, Antoinette Cléroux, Antoine Cléroux, Hélene Laferrière, R. Délima Morin, Ida Hague, Mme. Ed Saunders, Peter Dirks, Cart Pokrant, Réginald Penton, Henry Rosner, Nicholas Toews, Blanche Charbonneau, Lucille Richot, Helen Bestwater, Lily Boese, Simone Comeau, Blanche Barnabé, Jeanne Caron, Yvette Dupuis, Antoine Lussier, Helen Peters, Agnès Lafrance, Roger Vermette. St. Martin School: Clarinda Désaulniers, Denis desmarais, L. Massicotte, Georgina Rivard, Clarité Fortier, Thérèse Lemoine, Rose Levesky, Emérence Lussier, Antoinette Robert, Lucia Touzin, Arthur Vermette, Isabelle Champagne, Imelda Bérard, Jeanne Baril, Cécile Godard, Marie-Ange Ayotte, Claire Dupuis, Germaine Gauthier, Lilliane Landry, André Forest, Denis Marion, Madeline Morin, Cécile St-Hilaire. Levis School: Diane Chabot, Ivey Hensen, Roche Vander Hanten, Jeanne Jutras, Mary Saurette, Irène Guertin, Anne Gosselin, Germaine Martel, Yvonne Sicotte, Arthémise Dupuis, Yvonne Desautels, Louise Bonin, Denise Gratton, Alex Labossière, Marie-Ange Robert, Yvette Mousseau, Thérèse Guénette, Berthe Grégoire, Yvonne Landreville, Rita Valcourt, Lucie Lavoie, Yolande Combot. With the consolidation of schools, students today are bussed either to St. Jean, St. Pierre or Morris. In our parish, tragedy upset the lives of a few families. In 1910, Scarlet Fever took four children of the Thomas Bernèche family. Amédée Marion was dealt the same misfortune. He too lost four children in a short period of time. In 1913, a fire destroyed Rosario Dupuis’ barn along with 18 horses and all its contents. David Landry, the town barbers at one time, lost three children in an explosion that took place while he was adding kerosene to a lamp. He and his wife jumped from the second story along with a youngster; they were saved. In 1930, Mr. and Mrs. Hermas St-Godard also lost three children in a fire. In 1950 flood took the life of Roland Sicotte. He drowned when his canoe upset while trying to cross the Marsh River. Left to mourn Mr. Sicotte were his wife and seven children, the oldest of which was fourteen and the youngest a baby of one month. Today in 1981, Ste. Elizabeth parish has fifteen families. Though few in numbers, the spirit remains high in Ste-Elizabeth. The church is the only meeting place for Sunday services. An undaunted group, well deserving of its pioneers.